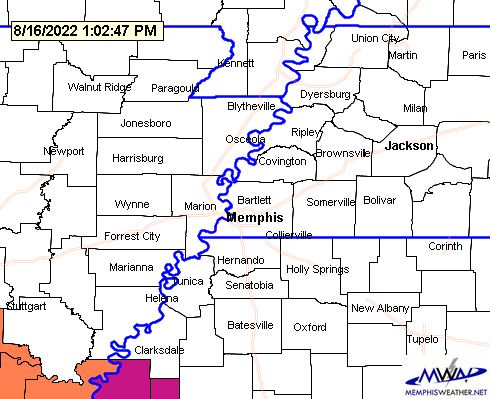 Watches/Warnings/Advisories: Winter Weather Advisory for Tipton County, 9pm tonight til noon Wednesday. 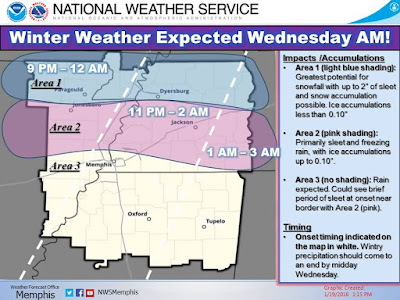 Winter Weather Advisory for Crittenden, Shelby, & Fayette Counties, 9pm tonight til 9am Wednesday. 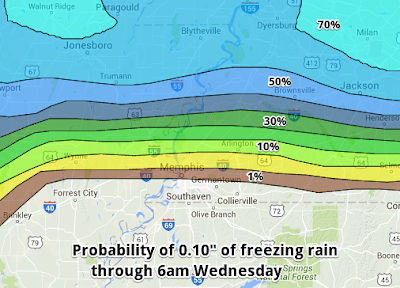 Possible Impacts: Minor icing mainly on bridges/overpasses in north Shelby County. A glaze on all surfaces with minor sleet accumulation in Tipton County, resulting in hazardous travel before noon Wednesday. After careful review of all available data this morning, confidence has increased in the potential for a freezing rain /sleet event for areas north of the Bluff City. In our metro counties, Tipton is our chief concern. Areas from Crittenden County east through Shelby and Fayette County are of some concern for light icing as well. 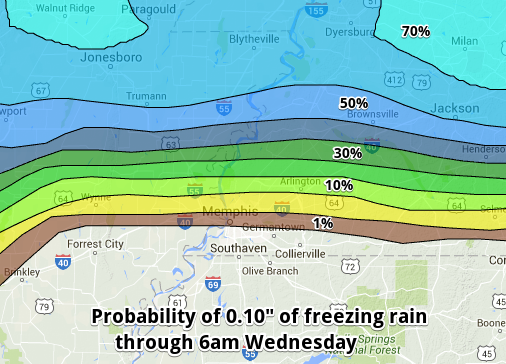 North Mississippi is not expected to see freezing precipitation of impact at this time. Precipitation will move across the region overnight tonight through mid-morning Wednesday as weak low pressure moves into the area and southerly wind increases overnight. Temperatures during the day today likely won't reach earlier forecasted highs due to cloud cover and easterly wind (which doesn't bring warm air), probably only reaching the mid 30s. This sets the stage for air to be near or below freezing north of I-40 tonight when precipitation arrives. As the night progresses, very slow warming is expected as southerly wind increases aloft, but the freezing line will likely be very near the Shelby/Tipton border as precipitation falls most steadily in the 3-9am time frame. For northern Shelby and southern Tipton County, warm air above the surface means the surface temperature will determine whether the rain that falls freezes on contact (freezing rain, which glazes cold exposed surfaces) or not (at 33° or above). Further north in Tipton County, there appears to be some colder air trapped in the lowest couple thousand feet, which introduces the possibility of freezing rain mixing with sleet. A very small amount of precipitation is possible late this evening and early overnight as mid-level moisture moves over the region. However, due to very dry air in the low levels (today's dewpoint below 15° is Exhibit A), most of that initial precipitation should evaporate as it falls. It will serve to moisten up the low levels though, prepping the atmosphere for the steadier rain later in the night. From the NWS, the probability of one tenth of an inch of freezing rain (enough for minor impacts, including hazardous roads) through 6am Wednesday. Temperatures could be near or just below freezing in Shelby/Fayette/Crittenden Counties during this early period, but any rain should be so light as to not cause much in the way of impacts. If you'll be traveling on overpasses or bridges overnight though (say for instance, the new mega-flyovers in east Memphis), you'll want to exercise caution. The main impacts will be felt in Tipton County, where total ice accumulation from this event could reach 1/4" with minor sleet accumulation as well, especially near Covington. This will be enough to make roads slick (especially since the temperatures ahead of this system are cold and there is no sunshine to warm the roads) and glaze over trees, power lines, and other exposed surfaces. Widespread power outages are not expected though due to the relatively light amount of precip and, with temperatures warming above freezing during the day Wednesday, ice should melt as the day goes on. Caution is advised for those traveling after midnight and before about noon Wednesday in Tipton County and points north, or if you're heading east towards Nashville on I-40 during the morning. 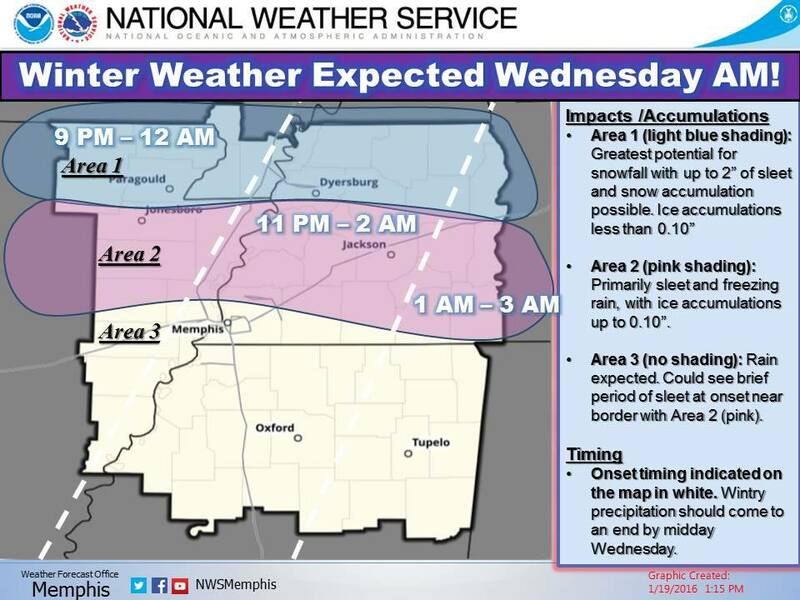 Early afternoon winter weather graphic from NWS-Memphis. Click for larger image. Looking ahead, rain is expected Thursday and Thursday night before likely changing to light snow early Friday. This system also has the potential for some winter weather impact on Friday. We'll tackle that one once we get through the first one! We'll have the latest info on our social media channels listed below. 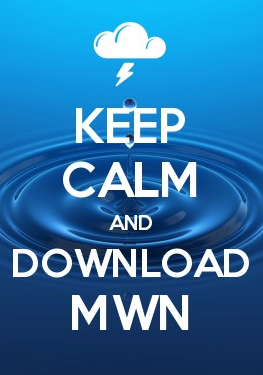 Also be sure to download the MemphisWeather.net mobile app for current conditions from around the metro, our latest MWN Forecast, current watch/warning/advisory map, as well as our Twitter feed. StormWatch+, when activated, will let you know of any changes to the Winter Weather Advisories via push notification.